Communication and negotiation expert Donny Ebenstein also addresses getting unstuck, but in the context of resolving conflicts with others. Writes Ebenstein, “to truly get unstuck, you need to do more than put yourself in the other person’s place. Rather, you need to build your capacity to see different perspectives at the same time.” The author offers a comprehensive guide to doing just that, moving from exercises and mock dialogue that help define one’s own perspective to understanding and accepting the perspective of others. Ebenstein doesn’t stop there. He recognizes that getting stuck in your own perspective is as problematic as getting lost in someone else’s perspective. That’s why he helps the reader work on telling both stories at the same time. The author offers role playing and other exercises that hone the skills necessary to succeed at this duality. While Ebenstein deals primarily with conflict resolution in the workplace, it becomes increasingly clear that the book’s strategy can just as easily be applied to any one-to-one interaction. He counsels the reader that there are three possible outcomes in any stuck situation: It gets better and the relationship improves, it remains the same and one deals with the status quo, or it just can’t be fixed and one walks away from it. Ultimately, Ebenstein’s approach is really about empowerment. 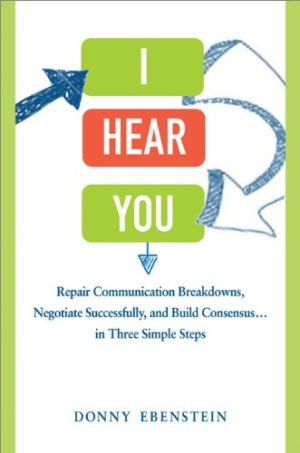 Ebenstein writes with authority and impartiality, drawing on his years of experience to explain and illustrate by example his approach to repairing communication breakdowns. Mastering the skills Ebenstein describes here should vastly improve anyone’s ability to build consensus.